The Cuban In My Coffee: DIY Drift Wood Mirror.......Finally! 1) I don't live near an ocean that gives me free drift wood (booo) so I purchased a large lot of it from Etsy for $100. It came in all shapes, colors and sizes which is good. 2) I seperated the wood light from dark since I prefer the light and grey colors. I took the others outside and sprayed them with bleach water to try to lighten them up a bit which worked a little. 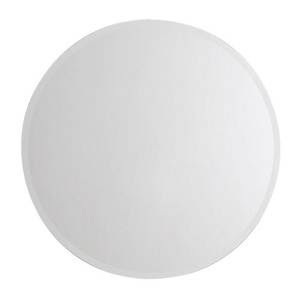 3) I went to Ikea and purchased a 30" round mirror for only $20 bucks, Yea Baby! 4) I went to Home Depot and purchased a 1/4" ply wood and had them cut it for me into a 35" square. This was about $6.00. 5) I drew a circle around the ply wood making it about a 34" circle to use as my border frame for the mirror. No specific directions for this. I had a tough time getting it exact but it really doesn't matter since you only use this as your frame to adhere the wood to. 6) I glued the mirror to the ply wood using a maximum strength adhesive such as Liquid Nails since you need it to be strong enough to really hold the mirror and all the weight of the wood. 7) I started to hot glue the drift wood to my frame. It is a bit tricky and is kind of like a puzzle. My tip here is to start with your undesirable larger pieces which for me was the dark pieces since you will build that up and will eventually put the ones you want on top. 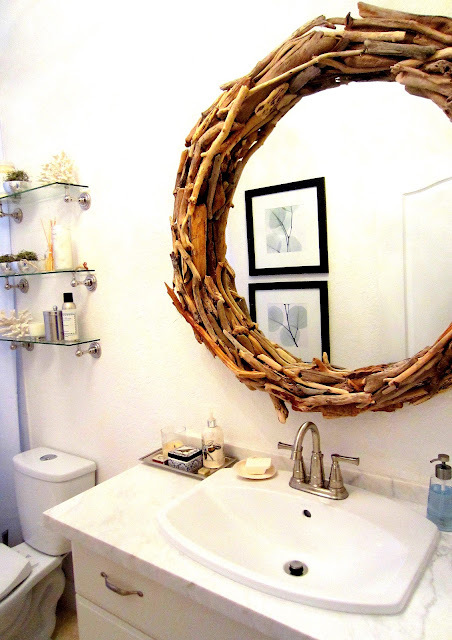 *Notice my Domino Book open with my inspiration picture of "The" drift wood mirror. 8) Once all is done I used a nail gun to nail the pieces together just in case my glue gun fails me. 9) Look at your amazing results! Clearly it can't be fully appreciated until it's hung so here is the updated final results in the finished bathroom. WOW!!! Looks awesome! Cant wait to see it hung in the bathroom. So nice!! Yes--so excited there's another Miami blogger in the same design-craving boat I'm in! We are very rare :) I'm your new follower! This is amazing. Beautifully done! You need to link this up to the link parties! Hi jandjhome, thanks for checking it out. I loved your wood DIY projects too and may take one on in the near future. What do you mean by the link parties? I think I responded to you on your comment. Is your email address linked up to your comments? I figured you hadnt learned about them yet. On my left sidebar there is a page that says linky parties. I've been trying to get it organized. Go into each of those sights on the day listed and you can link up your projects, crafts,etc. It brings tons of traffic to your blog and you may even get featured. There are tons more out there, but that's a good place to start. You just link up your project and add a picture of it. It usually gives you instructions. Let me know if you have any questions. Thanks jandjhome, (name? LOL) my email is linked up. I will definitely give that a try thanks for the heads up! It's beautiful, all an artist :) Greetings from Seville (Spain)! See the guy in the picture on the left in your Domino book? We rented a vacation house from him last winter, and this mirror was hanging in the bathroom. It's huuuuge. I grew up in South Florida, and we got plenty of driftwood, but it was all very large, and different from what you would find in a river or stream. Hi NYCrochet, how amazing. That mirror is why I decided to make one in the first place. I couldn't find one that was large and resembled the Domino one enough so I went for it. Lucky you to have seen it in person. Great inspiration! I'm looking to do one of these myself and I'm definitely using this post for reference. Great job! I have been researching these mirrors for weeks and yours is just as nice - if not nicer - than many I'm seeing retailing for $500+. Good for you! Enjoy it! How many pieces of driftwood did you need for your project? I just bid on a lot of 150 small to large pieces on e-bay for $22 including shipping. Hi Sarah, I bought a large box but if my memory suite me correctly it was around 150pcs. I hope that helps and I would love to see your finished mirror or project!!! Please share and link back to me so we can see it. This looks great! We just moved into a new house, and I've been looking for mirror ideas for the bathroom. Just might have to try this one out. Thanks for the tutorial! Hi "TheLittleBungalow", I hung the mirror easily by mounting a hanging kit to the wood on the back of the mirror. If you look at the tutorial I glued the mirror to a rounded piece of ply wood which is what I used to glue all the drift wood to. Once this is all in place you can screw on a mirror hanging bracket and wire kit found at any Home Depot or hard ware store. Good luck! I would love to see the finished results so let me know. Hi, great project! Just wondering, did you cut the plywood into the 34" circle or leave it a 35" square? Hi Whitney, thanks! I actually jig sawed off the rough edges and made it more circular so that the wood would be even around the mirror instead of lop sided, but it doesn't have to be perfect. Beautiful. About how much of the driftwood you purchased did you use ? Hey Cgal, I used about 3/4 of the box of wood from Etsy. You really have to layer the wood. Hope that helps!